I was in a bit of a reading funk prior to reading The Summer of Broken Things. It wasn't for lack of good books, it was just a lack of motivation to read. Nothing was capturing my attention...but then this book happened. What I thought was just going to be your "run of the mill" coming of age story turned into the one that would break me out of my funk, wrap its pages around me like a warm blanket and tell me a great story! Firstly, the characters for me were the star qualities of this book. Yes, the story is spectacular but the characters really bring it home. I loved the dual perspective and it was delivered flawlessly. Not once did the characters blend or get lost within one another. Margaret Haddix penned 2 very strong female characters; They really were the stars of the show. Having said that, nowhere did the book fall flat. Haddix crafted a perfectly paced story with twists and surprises that I never expected. Almost like a Russian nesting doll: beautifully detailed and layered. 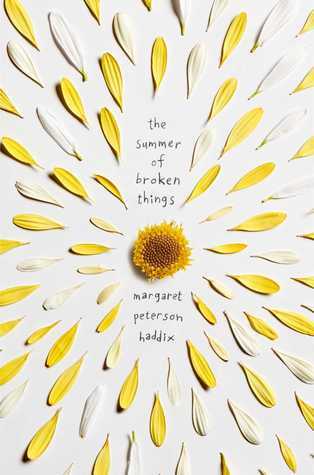 The Summer of Broken Things went far beyond my expectations. A wonderful story of self-discovery and growth. An in-depth story about 2 girls and family secrets. It was everything I could have asked for in a book!